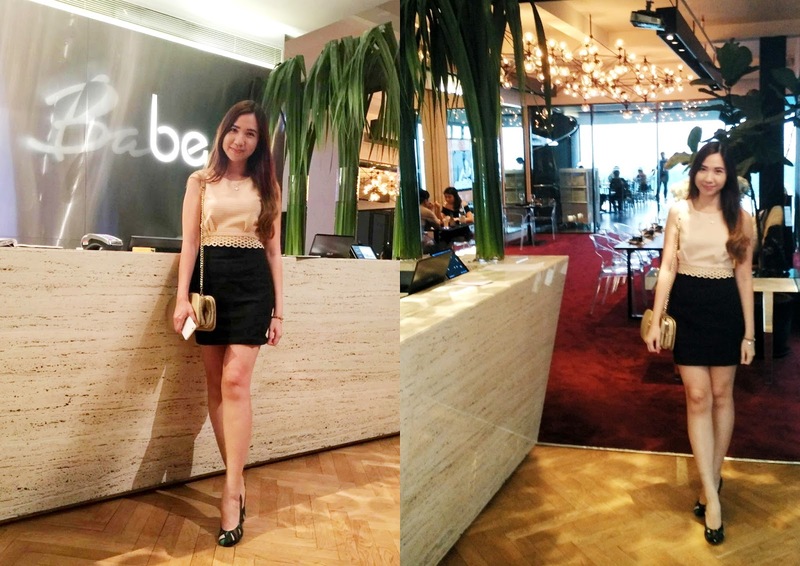 BABE by Michelin Star Chef Jeff Ramsey @ Clearwater Damansara Heights KL – An Unforgettable Experience. « Plan B Kitchen Takeover @ Bangsar Village I KL – Just Alright. As I’m writing this, over a week after the multi-sensory gastronomic dinner I had, everything still felt vivid on my tastebuds. This is also one of my most memorable dinner of all time. Ever since I heard about the opening of BABE late last year, I was undoubtedly keen to visit. Created by Michelin Star Chef Jeff Ramsey, BABE is a modern Japanese-Tapas (Japas) fine dining restaurant, that promises an unforgettable yet fun dining experience. The skyline view of the city was simply the icing on a cake. My degustation meal was priced at RM300 per person. A 15-course dinner, showcasing some of the chef’s creatively crafted signature dishes. Each course was introduced by the servers, explaining the dish’s concept and its ingredients. Be prepared to be surprised! I have to be honest however, despite the flourishing words, I wasn’t a fan of the less-than-attractive seating arrangements. Tip: Reservations are essential and request for a table indoors. You can also view BABE’s Full Course Menu And Prices Here. Lastly, I’d like to apologise for the horrendous pictures. The dimly-lit settings weren’t exactly photography friendly (this is as good as it gets!) and furthermore, the ongoing servings of food prove distracting. 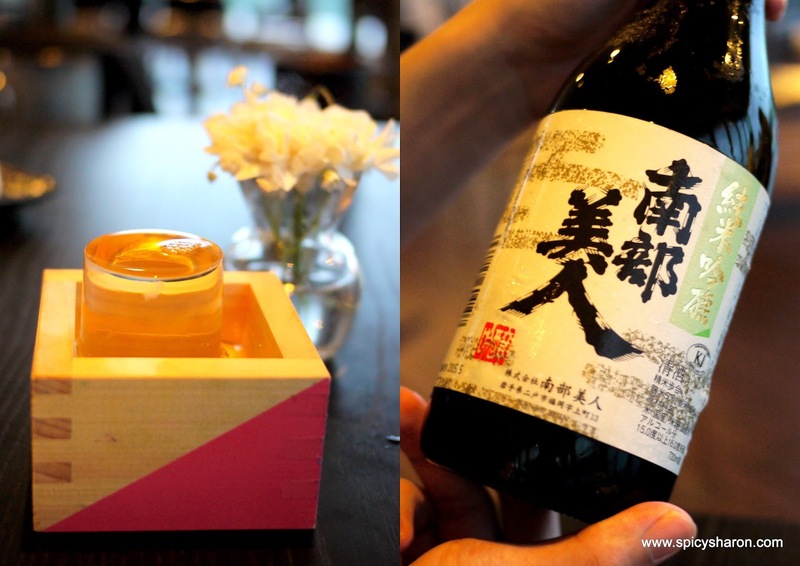 The evening began with a bottle of Suzukagawa Junmai Daiginjo (Rm260/720ml), which lasted us throughout the night. 1. Japanese Clam Chower – Potato mousse, Smoked coconut bacon shreds, Onion marmalade, Chive oil, Clam sphere. Our first course exudes bold, onion infused flavors. The clam sphere hidden inside the potato mousse was probably the most exciting part of this dish for me. Popping a pearl with clam essence inside! Now that’s a first. 2. Sashimi Cigars – Crispy spring roll stuffed with 3 Types of Sashimi – Tuna, Salmon and Yellowtail. I had difficulties picking these up with my lackadaisical chopstick skills. I ended up using a fork instead. 3. Curry Buns – Baguette (or not) and Pulled Curry Chicken. This ain’t no normal curry buns. The macaroon-shelled buns were marvelous – addictive, chewy and sweet, layered with savory pulled chicken curry patty. Also one of the best burger rendition I’ve had. 4. Ceaser Salad – Romaine lettuce, Ceaser dressing, Croutons, Cheese smoked bacon coconut, Parmesan. I had a strange but wonderful sensation once I popped the entire spoonful into my mouth. It tasted as though I’ve just eaten a spoonful of ceaser salad, but with contrasting and unrelating textures. That green ball – a frozen sphere of romaine lettuce blended with ceasar dressing, which had sorbet-like textures. Croutons here on the other hand, came in the form of a biscuit base. 5. Thai Chazuke – Konbu marinated Seabream, Toasted rice puffs, Sour plum jelly sphere, Shiso and Tea. 6. Irish Smoked Oyster – Smoked oyster, Ginger, Herbs, Lemon zest. 7. Niku Jaga – Wagyu, Potato mousse and Caramelised onions. Meant to be served as a Japanese styled donburi, BABE’s version of Niku Jaga was cleverly presented in a sushi form instead, minus the rice. Underneath the delicious pan-seared wagyu, a crunchy potato croquette stuffed with potato mousse. One of my favorites for the night. 8. Shimaji – Stripe jack and sesame powder. 9. 1000 Year Old Smoked Cypress Yellowtail Nigiri. There’s a story behind this dish. 10. Ikura Gohan – Butter rice and Salmon roe. 11. Prawn And Mussel Combo – Prawn, Mussel, Red pepper drops, Onions, Seaweed. The prawns were bouncy and huge; the mussels were fresh and fantastic. The sauce base oddly reminded me of the typical American deep-fry. 12. Soy And Red Wine Braised Short Ribs – Short ribs, Sweet potato puree, Chinese cabbage. Everything on the platter plays a role in this multi-sensory dish. Remember to have a pinch of every ingredient presented in one mouthful. Possibly one of the best wagyu I’ve had. Ever. 14. 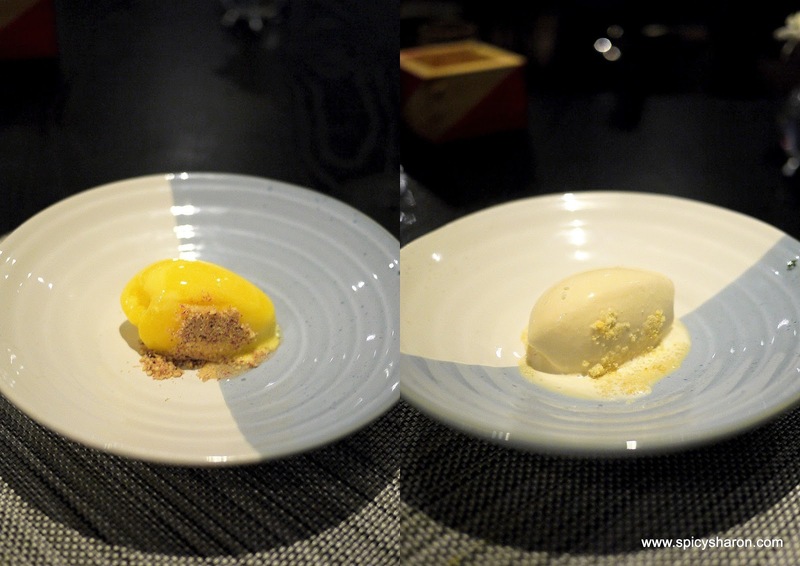 Nitro Puffs & Passionfruit and Buttermilk Sorbet. Playing with food! Literally. I’ll probably get a video uploaded in my Instagram soon. 15. Petit Fours – Butterscotch and Miso candy, Buttermilk chocolate, Strawberry slice and Cream. Three elements on the plate. First, pop the entire butterscotch and miso candy into your mouth (wrapper included). Secondly, devour the mini cadbury at the side. Thirdly, fold and leave the strawberry slice on your tongue, then smell the paper marked as “milk”. The whiff of vanilla scent and the taste of strawberry combined, created a sweet strawberry cream flavor. Interesting! Overall Rating: 8.5/10. I suppose the main reason I enjoyed my meal here so much was because everything had a fascinating and compelling element of surprise to it. It’s not difficult for me to lose interest in a meal, but this one, every dish from the first till the fifteenth course got me hooked. Understandably however, the menu price would probably only render visits during special ocassions. 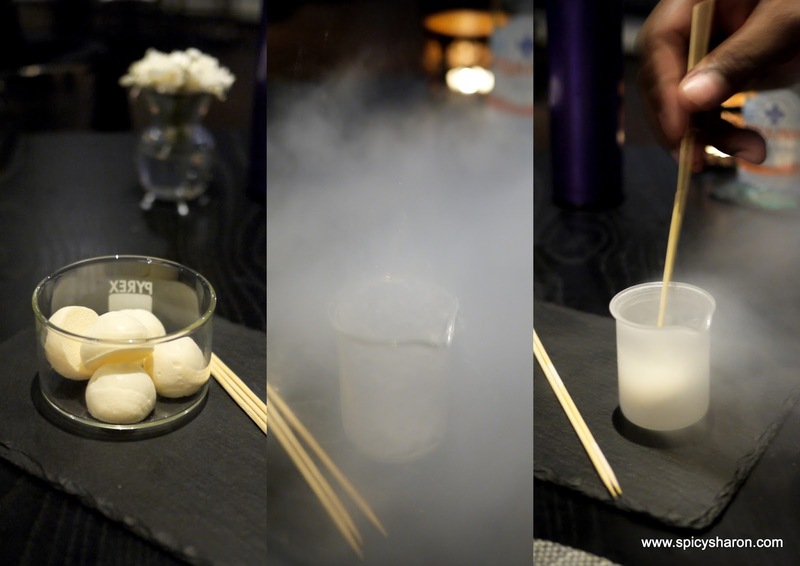 Having said that, the experience is definitely worth attempting at least once (simple math: RM300/15 course = RM20/dish). Alternatively, there is also a RM200 menu, but with less dishes served. Reiterating from above, I’m a huge fan of the food here but not the seating arrangements and interior. Lastly, as the title suggest, this was one, unforgettable experience for me. BABE is located at:Address: 11th Floor, Work@Clearwater, Changkat Semantan, Damansara Heights, 50490 Kuala Lumpur.Phone: +603.2095 8599Email: hello@babe.com.myOpening Hours: 7.30pm & 8.30pm Seatings. Closed Mondays.